Creating a unique embroidery pattern for each of the 50 U.S. states was no easy task. From inspiration to design to finished product, each pattern was carefully thought out and executed. The end goal was to use recognizable images to represent a taste of what makes each state special. For inspiration, I sometimes turned to official state icons such as the flag, state flower, bird or tree. The very first state pattern I designed was Colorado. With a fairly distinct and ascetically pleasing state flag, I knew I wanted to incorporate at least some of it into my design. I also knew I couldn’t properly represent Colorado without mountains and trees. 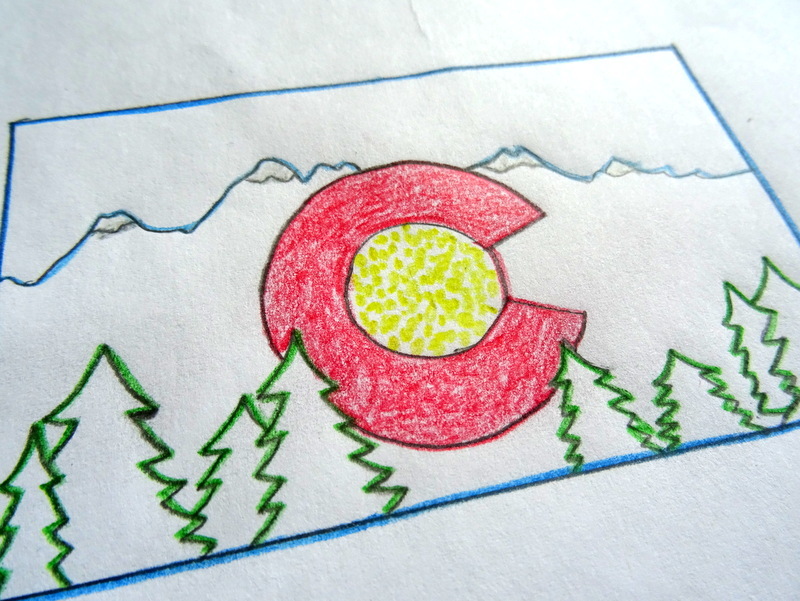 Eventually, my hand drawn design came together with the Colorado “C” from the flag set against a backdrop of snow covered mountains and a stand of evergreen trees. Other times, I pulled from my personal experiences while visiting a particular state. 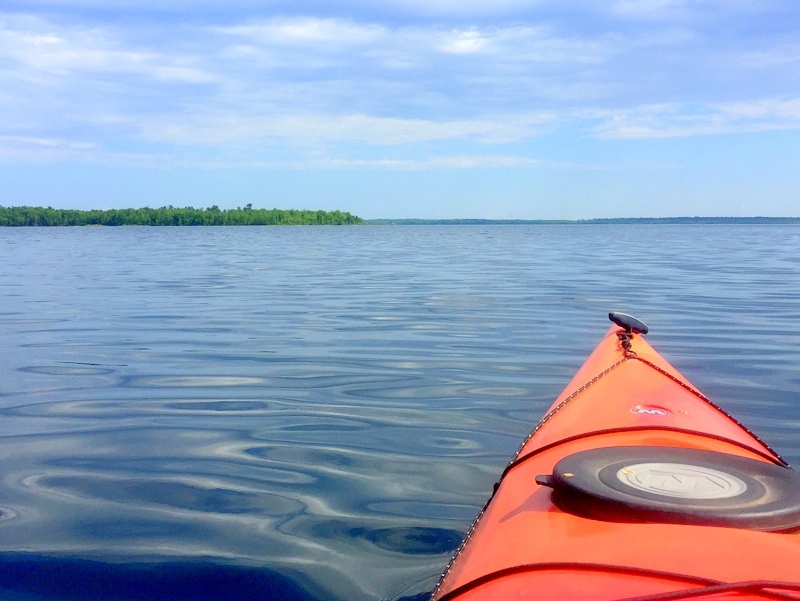 Last summer, we spent a month in Minnesota exploring a handful of the 10,000 lakes set amid dense forests and low rollings hills. We moved our house on wheels around to the many campgrounds that dot the lake shores and spent the long summer evenings paddling the clear blue waters. After our time in Minnesota, I knew the state design must prominently feature water. So I turned the entire state into a lake with a bright orange canoe smack in the middle. This is Minnesota! In addition to representing each state, the U.S. state patterns are designed to be simple. The goal here at Wandering Threads is to share the craft of embroidery with everyone — beginners and experts alike. 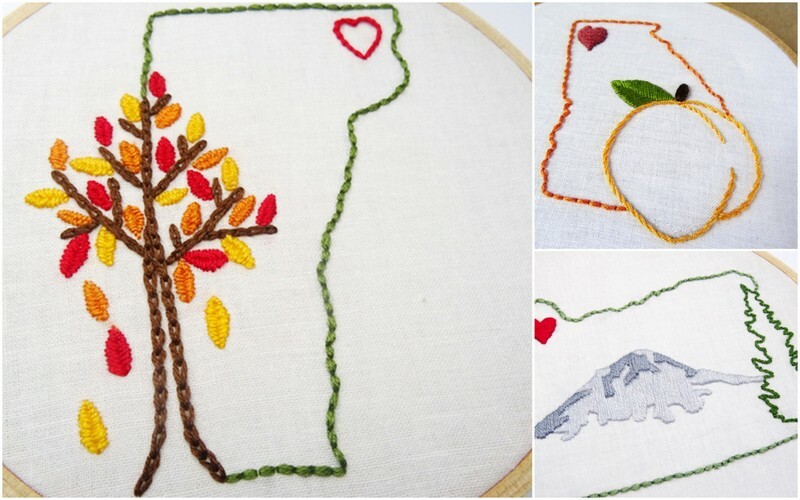 Because the state patterns are designed to be small — each PDF contains a pattern that fits either a five or seven-inch hoop — the images must be simple and easy to stitch on a small scale. In an effort to create designs that were both easy to stitch, rich in detail, and small enough to fit inside the state outline, I often incorporated the images into the shape of the state. In Georgia, a juicy ripe peach sits at the bottom of the state, in Oregon, a tall evergreen tree dominates the eastern border, and in Vermont, falling autumn leaves drop from state’s western edge. 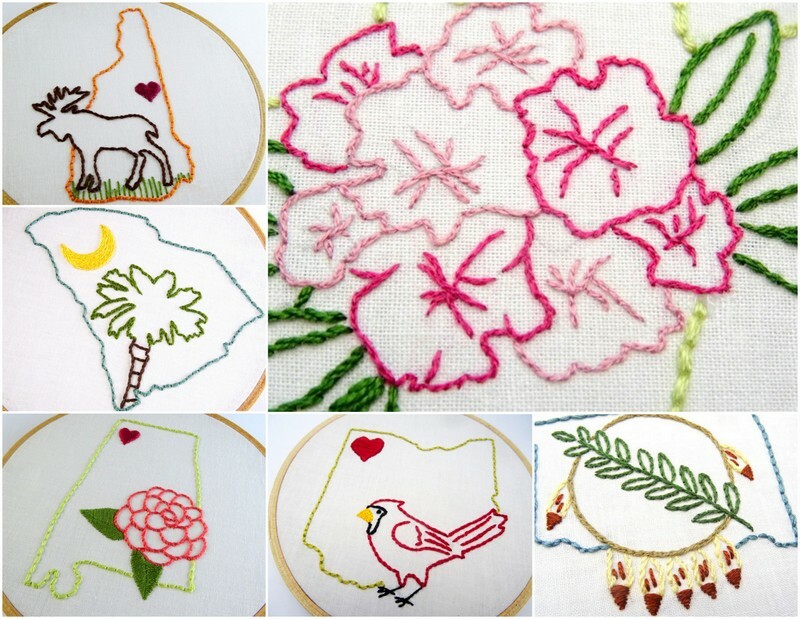 For a complete listing of all the Wandering Threads state embroidery patterns, visit the State Patterns page.